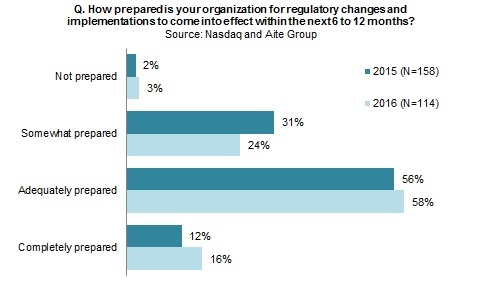 Only a small percentage of firms consider themselves fully prepared to meet upcoming regulatory challenges. Boston, December 14, 2016 – Combined with the ever-present concern of protecting the firm’s reputation, managing all the pieces in the compliance puzzle presents formidable challenges for compliance departments. To help tackle these hurdles, compliance personnel seek out the latest regulatory-focused technological solutions; likewise, financial technology vendors strive to keep up with demand by continuously developing cutting-edge offerings. Thus, regulatory technology—or regtech—is poised to meet the growing demand from compliance departments. This report examines the current regulatory environment and its effect on sell-side firms, buy-side firms, and corporate entities that engage in trading activities. Based on proprietary Aite Group research as well as data collected in surveys executed by Nasdaq and Aite Group in 2015 and 2016, it explores the globalization of regulation, key regulatory and functional challenges, the current state of firms’ regulatory preparedness, and the importance of compliance departments’ various duties. This 28-page Impact Note contains 23 figures and one table. Clients of Aite Group’s Institutional Securities & Investments service can download this report, the corresponding charts, and the Executive Impact Deck. This report mentions Nasdaq, Thomson Reuters, Wolters Kluwer.